The Elbphilharmonie on the Kaispeicher in the midst of Hamburg’s HafenCity marks a location that was known to the public but not really accessible. Architects plan that the future will bring a new center of social, cultural and daily life for the people of Hamburg as well for visitors from all over the world. The building was still in use as a warehouse until the end of the last century and now became a Philharmonic hall. The robust architecture of the site provides an ideal foundation for the new content. The new building has been extruded from the shape of the Kaispeicher. 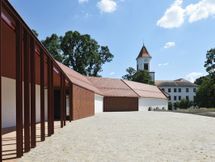 While rising above the brick block of the older building with an identical ground plan, the top and bottom of the new structure are fundamentally different from the calm and simple form of the warehouse below: the broad, undulating shape of the roof rises to a total height of 110 m at the Kaispitze (the tip of the peninsula), sloping down to the eastern end, where the roof is 30 m lower. The bottom of the new structure, on top of the warehouse, is a lively animated plaza, divided into zones defined by expansive vaulting, ranging from flat to very steep. An arch cut into the side wall affords views of the sky and spectacular, theatrical vistas across the river Elbe river and downtown Hamburg. Deep recesses cut into the building above the plaza provide views of the foyers on several levels. In contrast to the brick façade of the Kaispeicher, the Philharmonic, clad in variously curved and cut panels of glass, looks like an immense crystal. The complex geometry of the hall unites organic flow with incisive, more static shapes. Rising vertically almost like a tent, the concert hall seats 2150 people to enjoy the pleasures of making and listening to music. Its towering shape defines the structure of the entire volume of the building and is correspondingly reflected in the silhouette of the building as a whole. As a landmark visible from afar, the Elbphilharmonie will lend the horizontally oriented city an entirely new accent, symbolizing Hamburg’s foray into the new territory of the harbor area along the shores of the Elbe. Originally estimated to cost €77m in 2005, the projected price had shot up to €114m by the time the building works started in 2007. In 2013, the mayor of Hamburg then announced that the project would cost €789m.